My penmanship is awful. Sure, I do calligraphy once in a while, and I can write clearly enough for business use. However, it can get to the point where even I can only stare in confused befuddlement at what I had written a few days earlier. I can abuse the proper letterforms of the Roman script pretty fierce, y’all. I make no claim as to the contrary. To fix this awful state of illegibility, back in high school, I developed my own version of the Roman alphabet to be used as a cursive or shorthand for personal notes, journal entries, and the like. I was big into developing writing systems back then, and came up with a number of them, some even with their accompanying languages (yes, I’m a conlang nerd, go away). I ended up sticking with this script I developed, and over the six or seven years it’s been in use I’ve made a few changes to it. It’s getting slightly more elaborate, but only for the sake of making writing easier without sacrificing clarity too much. I claim that this shorthand, which I just call my shorthand, cursive, or “it’s how I write, stop treating it like some arcane manuscript (even though it probably is, wink wink)”, is simple to learn. Most of the letterforms are simply the Roman script reduced or simplified in some way: there are no capital letters, double letters are usually represented with a single dotted letter, the letter A is the same with the horizontal bar removed, the letters B, D, R, and P are the same with the vertical bar removed, and so forth. There are some new letters I devised, based on Greek, Tironian notes, and so forth, that account for ligatures or digraphs in English, but they’re easily learned. 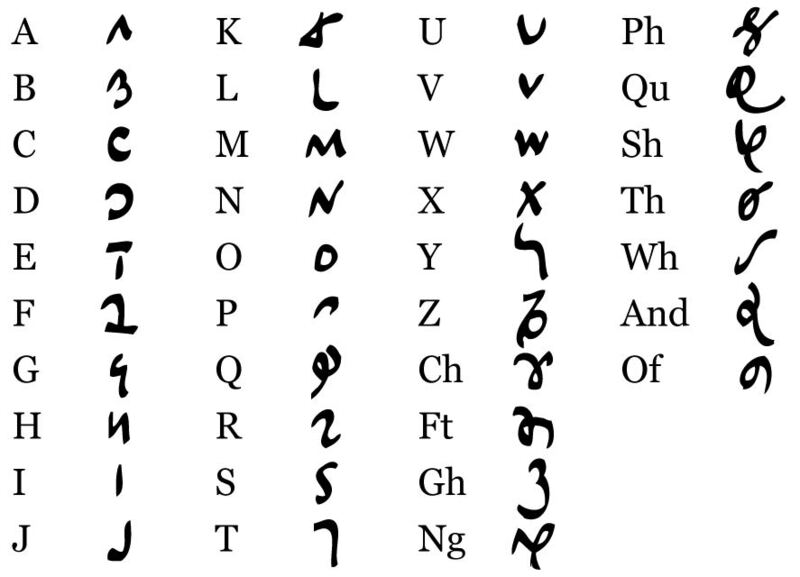 As you can see, most of the letters have a 1-to-1 correspondence with those in the Roman alphabet for English. There are also several new letters for the digraphs Ch (like in “chance”, not “chemistry”), Gh, Ft, Ng (like in “angle”, not “angel”), Ph, Qu, Sh, Th (like in “thence” not “Thomas”), and Wh. Two special symbols is used for the words “and”, which is basically a simplified ampersand, and “of”, which is a lot like the Japanese hiragana character “no”, which is also the Japanese possessive particle. There are also special forms for Ee, Ff, Jj, Ll, and Tt; these double letters are written and cross or join each other, although the other letters simply take a dot. In theory, all letters that aren’t those listed above take a dot for doubled forms, some are simply never used in English (one will never have a doubled Q or Sh, though this may be the case in other languages). Because there are a lot of Latinate derivatives in English, which often use trigraphs like “sio” or “tio”, I also have forms for these groups of letters. Although there may be others, the only letters I can remember having these forms are Gio, Rio, Sio, Tio, and Xio. Adding an N to make Tion or Sion to them is natural and can be done by simply continuing the stroke. Some letters have descenders and ascenders that go over the next or previous letters. This is more to save space on the actual line of text than anything else, and is also why, from an aesthetic standpoint, the letters F, J, L, and T have special doubled forms. The letters K, N, U, V, W, X, Ch, Ph, Th, and Wh are special since they fall into a class of letters that have a high diagonal stroke upwards and to the right. Some letters join them easily, such as K and D. However, when the letter E or Ee follows these letters, their forms are changed into little dashes that cross the diagonal stroke on these letters. The E dashes on these words come last in stroke order so that other letters might be able to join up with the base letter first. This is a time-, space-, and ink-saving gesture. Wh also falls into this class, but only for the letters E and Ee; other letters don’t do anything with this letter since its diagonal goes too far up. So, putting this all together, we can write words that are both easily read by someone not used to the shorthand and those that take some practice to read. All, however, take fewer strokes and less time to write. 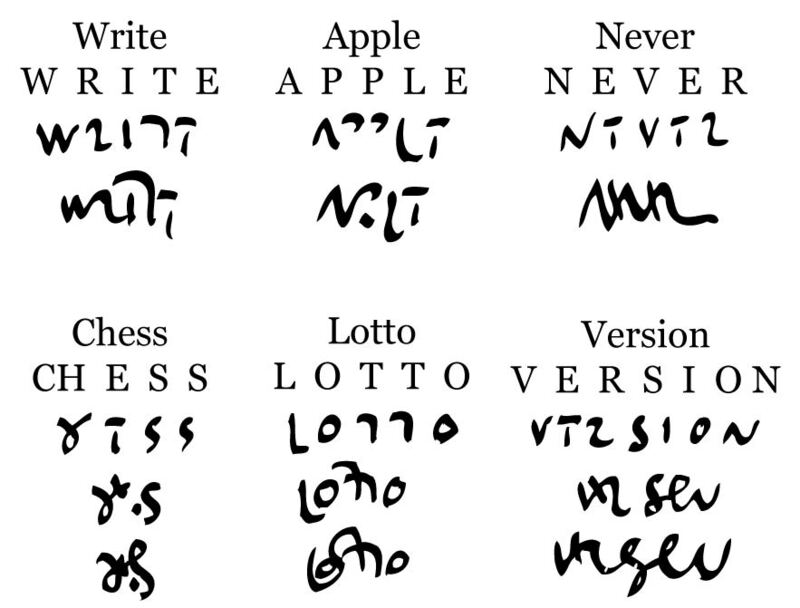 “Never”, “Version”, and “Chess” are all written with a single stroke with the addition of half-E strokes and doubling dots. The S in “Version” looks similar to Ph, since it’s joined to the preceding R and is in its Sio form. However, I don’t use Phio for anything, so it by default has to mean Sio. Why am I showing you all this? Well, a drunken conversation with my sister helped spur this post when we were talking about how we do our sigils. Some people might be interested to see what kind of script I use for devising my sigils, since the simplified letterforms lead themselves well to sigilization and linking up with each other for an appealing but still easily visualizable shape. I have a few rules for making sigils using this shorthand, such as always linking all Ms, Ns, Hs, Vs, and Ws (which all share the same basic zig-zag shape), and so forth. Otherwise, if I die and someone wants to claim all my journals and notes, this post will help them decipher my otherwise unintelligible handwriting. I have the convention of using my shorthand for notes, directions, and instructions in my notebooks and tomes, with Roman script used for orations or prayers. Plus, if I ever decide to hand-write and -illustrate a tome for myself (either as a completed copy of my current vademecum or as a gift for someone else), I’ll probably use the calligraphic form of my shorthand, which will look pretty indeed for a whole book. Tedious, but pretty. That’s all that really matters, right? For the record, I am shamelessly stealing this for sigilization purposes, lol. Mine have the habit of looking like they came out of a bad Spare example, but I’ve had a hell of a time trying to figure out how to class them up a little. Have at. I think I’ll do a followup post in the future about how I use this script, along with more fuller examples (like Article One of the Universal Declaration of Human Rights), calligraphic tips, and creating sigils with it. This is cool. I kinda want to make my own one. I want to make my own alphabet, too, now. Except that I really want my books to be legible when I’m gone, so someone after me can make use of them. What a dilemma! It’s not hard; it’s a matter of finding what works best for you. And having a clear key, so people can easily learn and transcribe things from one script to another.